Chanteur Rock 'n' Roll US né le 29 Juin 1938 à Dayton (Ohio). 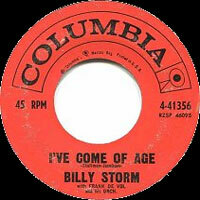 Billy Storm, born on June 29, 1938 in Dayton, Ohio, hit the US charts at No.28 with ‘I’ve Come Of Age’ in 1959. Billy had an incredible recording career. As Billy Spicer, he was a member of the Sabers, who recorded ‘Always Forever’ on Cal-West 847 in 1955 (other members were Sheridan Spencer, Brice Coefield and Walter Carter). In 1956, the group (with Chester Pipkin replacing Carter) recorded as the Chavelles on Vita 127, with ‘Valley Of Love’. By 1957 they had become the Gents, recording ‘Happenin’ After School’ (Aladdin 3387). 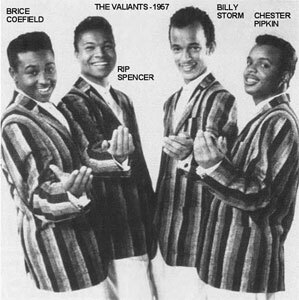 The same year, they performed as the Valiants, issuing ‘This Is The Night’ (Keen 34004), then ‘Lover Lover’ (Keen 34007, 1958), ‘Temptation Of My Heart’ (Keen 4008, 1958) and ‘Please Wait My Love (Keen 4026, 1958). 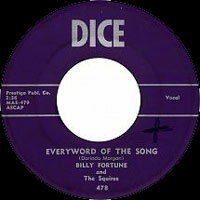 As Billy Storm and the Valiants, he released ‘We Knew’ on Ensign 4035, then turned up as Billy Fortune and the Squires for ‘Every Word Of The Song’ on Dice 478. 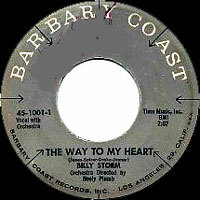 Billed just as Billy Storm he released ‘The Way To My Heart’ on Barbary Coast 1001, then signed to the Columbia label.In 1959, his first Columbia single, ‘I’ve Come Of Age’ (41356), hit the US charts at No.28. The follow-ups – ‘Easy Chair’ (41431), ‘Emotion’ (41494) and ‘When The Whole World Smiles Again’ (41545), all 1959 - were not successful. 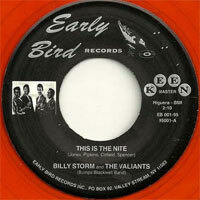 With the Valiants, he released ‘This Is The Nite’ on Keen 82120, 1960. With the addition of Don Trotter and Ed Wallace, the same group were the Untouchables on Madison 134, with ‘Goodnight Sweetheart Goodnight’. 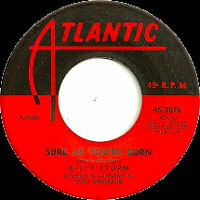 Billy next signed solo for Atlantic, releasing ‘Sure As You’re Born (2076), which was issued by London in the UK. 1961 saw the release of ‘Dear One’ (2098) and ‘A Kiss From Your Lips’ (2112). His next single, ‘3,000 Tears’ came from the Gregmark label. The group (now consisting of Chester Pipkin, Warren Joyner, Billy Mann, Billy Storm and Gary Pipkin) now appeared as the Electras on Infinity 012, with ‘You Lied’. 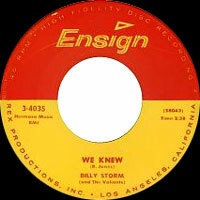 The same line-up appeared as the Freedoms on Constellation 105 with the same song. 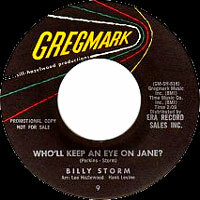 In 1962, Billy sang as a member of the Nuggets (under the name William Jones) on ‘Just A Friend’ (RCA 47-8031). 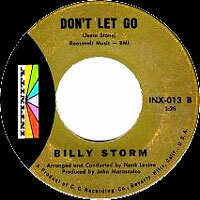 From 1962 to 1964, he pursued a solo career on the Infinity and Buena Vista labels with nine single releases. 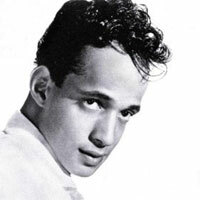 For Infinity he produced ‘Love Theme From El Cid’ (013), ‘Since I Fell For You’ (018) and ‘I Can’t Help It’ (023). Buena Vista singles were ‘Puppy Love Is Here To Stay’ (403), ‘Love Theme From El Cid’ (with different flip, 413), ‘Double Date’ (415), ‘Deed I Do’ (418), ‘He Knows How Much We Can Bear’ (424) and ‘Since I Fell For You’ (again, 429). In 1964, he turned up as a member of the Charades for ‘Flamingo’ on Skylark 108, then went solo again for ‘Baby Don’t Look Down’ (Lorna 2001, 1964) and ‘Goldfinger Theme’ (Lorna 2009, 1965). In 1966, the Electras re-surfaced for ‘Mary Mary’ (RubyDoo 2), while Billy Storm soloed with ‘Please Don’t Mention Her Name’ (Hanna-Barbera 474). 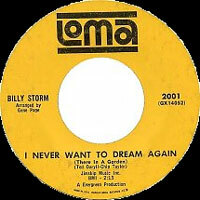 1968 saw a group called Africa (members Billy Storm, Brice Coefield, Rip Spencer, Chester Pipkin, Gary Pipkin, Ed Wallace, Billy Mann, and Freddie Willis) on Ode 116 with ‘Here I Stand’ The same year, Billy soloed on ‘Down Home’ / ‘Monday Monday’ (Ode 117), later re-released with ‘Coal Mine’ as the flip, on the same catalogue number. 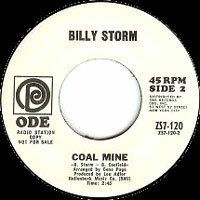 ‘Coal Mine’ turned up again as the A side of the next single (Ode 120). Still for Ode, Billy (with Joseph Green, Andrew Herd, Jesse Kirkland, Chester Pipkin, Ed Wallace, Fred Willis and Don Wyatt – and 20 female singers) recorded as the Brothers And Sisters Of Los Angeles on ‘Mighty Quinn’ (121) and ‘The Times They Are A-Changin’ (123). 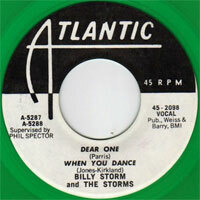 Africa returned in 1969 for ‘From Africa With Love’ (Ode 126), and again in 1972 for ‘Here I Stand’ on Epic 5-10848. 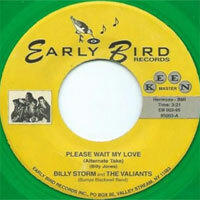 Billy Storm & the Valiants returned in 1995 with ‘This Is The Nite’ (a re-issue of the 1960 track, Early Bird 1001) and ‘Please Wait My Love’ (Early Bird 1003). 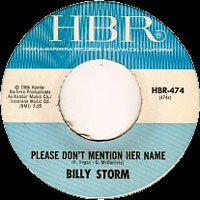 Throughout this long career Billy only had two album releases, in 1961 – ‘This Is The Night’ on Famous F-504, and later ‘Billy Storm’ (label not known). The Brothers and Sisters of Los Angeles appeared on an album, ‘Dylan's Gospel’ (Ode Z12 44018, 1969). As you might guess, all the tracks were Bob Dylan songs. 1958 SP DICE 478 (US) . 07/1958 SP Barbary Coast 45-1001-1 / 45-1001-4 (US) . 03/1959 SP COLUMBIA 4-41356 (US) . 06/1959 SP Ensign 3-4035 (US) . 07/1959 SP COLUMBIA 4-41431 (US) . 10/1959 SP COLUMBIA 4-41494 (US) . 12/1959 SP COLUMBIA 4-41545 (US) . 09/1960 SP ATLANTIC 45-2076 (US) . 03/1961 SP ATLANTIC 45-2098 (US) . 07/1961 SP ATLANTIC 45-2112 (US) . 10/1961 SP Gregmark 9 (US) . 01/1962 SP Infinity INX-013 (US) . 04/1962 SP Infinity INX-018 (US) . 09/1962 SP Infinity INX-023 (US) . 09/1962 SP BUENA VISTA F-403 (US) . 12/1962 SP BUENA VISTA F-413 (US) . 01/1963 SP BUENA VISTA F-415 (US) . 03/1963 SP BUENA VISTA F-418 (US) . 07/1963 SP BUENA VISTA F-424 (US) . 09/1964 SP LOMA 2001 (US) . 01/1965 SP LOMA 2009 (US) . 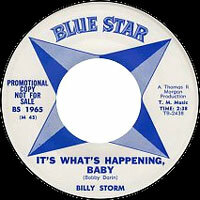 08/1965 SP BLUE STAR BS 1965 (US) . 1995 SP Early Bird EB 001-95 (US) . ???? EP ATLANTIC 45-2098 (US) (bootleg) .